I spent the week in Philadelphia, at The Wharton School at the University of Pennsylvania. It was wonderful, exhausting, distracting, uplifting. All of it. So many firsts. Met my first General, my first Blue Angel, my first billionaire. And used my body as a message to those I love. W.H.Y?? you ask. 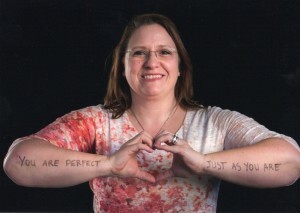 Well — check out http://www.dearworld.me/ It will explain everything! When Robert showed us his slide show of pictures — no, P.E.O.P.L.E. From New Orleans, Syria, Africa, small town America, …..from everywhere — he asked us to think about those we love. To think about what our message was. Because Robert hosted our Year 3 Graduation Reception — and we were each about to get a chance to be photographed by him. All we had to do was figure out what we had to say! I suggest to you….it’s not as easy as you might think. One message. On your body. Wherever, and however you want. Well — dozens of people flew through my head. My girls, Caity and Erin of course. And my mom, and sister Debbie, Peter, friends, and people I love. The one thing that resonated with me and I quickly tiptoed back through my own childhood and growing years was this………Why was I so hard on myself? Why am I still? Because I am perfect just as I am. So — there it was. My message, my gift to each of you in our “dear little shared world”……. You Are Perfect….Just As You Are! Please, I invite you to comment — and share your personal message too! Would love to hear them.